I am very happy with the service I have received from Cable Chick, both cables I have purchased are of excellent quality and delivery time for both items was super quick. I would not hesitate to recommend you to my friends and family. 3-in-1 Mini-DisplayPort to HDMI / DVI / DisplayPort Cable Adaptor - Thunderbolt Socket Compatible + FREE SHIPPING! A Multi-Adapter for connecting your Mini-DP / Thunderbolt socket computer to a HDMI, DVI or DisplayPort screen! This 3-in-1 Mini-DisplayPort to DisplayPort, DVI & HDMI adapter cable lets you connect from a DisplayPort source, to a monitor or TV featuring DisplayPort, DVI or HDMI input (only one connection at a time). Finally an inexpensive, compact and versatile adapter to cover all your Mini-DisplayPort backwards compatibility needs! 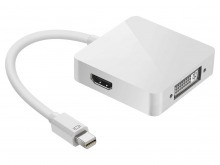 Stop messing around and get the all-in-one Mini DisplayPort adaptor for your Apple iMac, MacBook or MacBook Pro! Troubled by the conectivity options available on your Mini-DisplayPort equiped latop or computer? 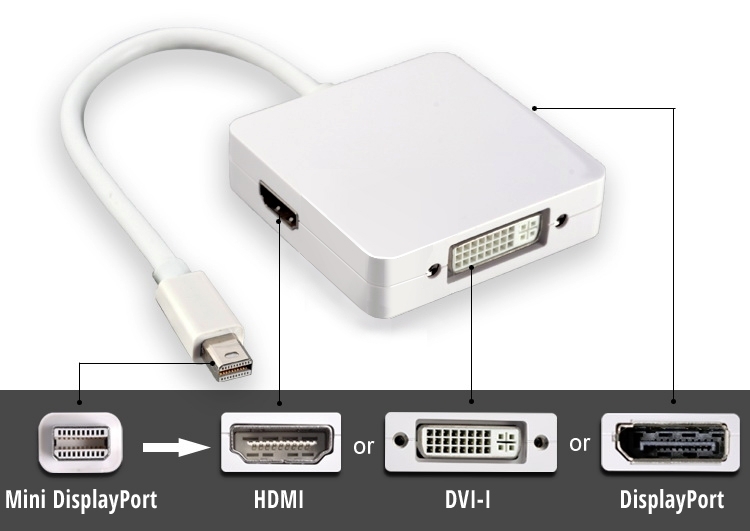 Let Cable Chick simplify your conectivity conundrum with this handy 3-in-1 Mini-DisplayPort adaptor. With a Male Mini-DisplayPort connector to plug straight into your computer, this convenient adapter offers three Female sockets - HDMI, DVI & Display Port - so you can establish a connection to practically any display device. All the product specs are top-shelf. It's a Full Mini-DisplayPort v1.1a Male plug, with DPCP as well as HDCP support and will output HDMI resolutions up to 1080p. Technically, it can also do audio (via the HDMI or DisplayPort output), but you will need to check your product specs to make sure your source device actually outputs audio over mini-DisplayPort, or you'll only get video. Now you just need to select some suitable HDMI, DVI or Display Port Cables to go with your shiney new adapter! The rest is smooth sailing! If your mini-DisplayPort source has support for HDMI compatible video output, it's as simple as plug-and-play. Check your manuals or look for the DP++ symbol to know if your source is ready for the conversion. This adapter is not bi-directional, and does not convert HDMI / DVI to Mini-DisplayPort. Tested with Surface Pro 2 and Surface Pro 3. Compatible with all Mini-DisplayPort DP++ equipred devices, including Macbook Pro, Microsoft Surface Pro 2 Windows 8 Tablet & Windows 10 Surface Pro 3. Mini-DisplayPort (MDP or MiniDP) adapters are not bi-directional, and require a Mini-DP output which is DP++ (Dual Mode) compatible. When a Mini-DisplayPort to HDMI adapter is connected to a DP++ (Dual-Mode) output, the output device senses the presence of the adaptor/cable and sends HDMI signals over the Mini-DisplayPort connector rather than a standard DisplayPort signals. No signal conversion is performed by the adapter. HDMI signals are merely passed through. Please note: Whilst the Adaptor can output to HDMI & DisplayPort, Audio support is dependant on the capability of the source Mini-DisplayPort device. Answer: "Dell don't specifically state the spec of the Mini Displayport socket on their XPS range, but we're confident that all modern laptops with DisplayPort are compatible with HDMI and DVI adapters such as this. Please note that this adapter only allows one display to connect at a time." Answer: "Yes. Tech specs available on the Lenovo website state: "digital monitor via mini DisplayPort" which to me suggests any digital connection is suitable. The x240 is also new enough that it would be extremely rare for their DisplayPort hardware to not support DVI and HDMI connections, so I'm confident our adapter is fully compatible." Answer: "If your Acer has a Mini-Displayport output, and your Apple Monitor has DisplayPort input, then this adapter is suitable for Video and Audio (in conjunction with a DisplayPort cable to complete the connection). However, USB sockets are probably not going to be available on the monitor." Answer: "Absolutely. Most basic passive adapters such as this only support Single-Link (up to 1080p) anyway - the manufacturers just use Dual-Link sockets so that more cables fit and they have to stock fewer parts to make all the products in their range." I'm very happy with your service and the product purchased (VGA Coupler). After I ordered a 20m VGA Monitor cable with your online Shop the delivery was so quick. I'm looking forward to deal with you again... and in fact I've already done so!